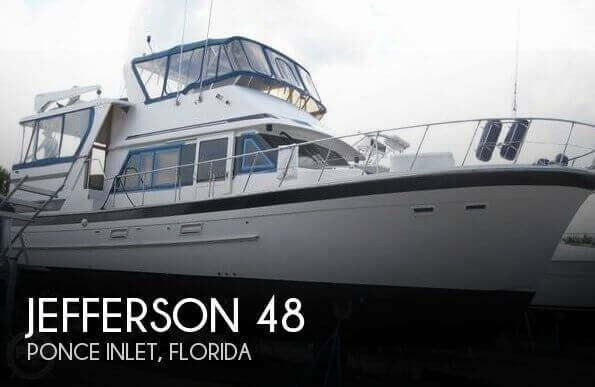 Stock #176032 Three (3) Staterooms, Two (2) Complete Heads w/ Walk In Showers, Salon, "UP" Galley, Huge Aft Deck, Fishing Cockpit, Huge Bridge If you are in the market for a motoryacht, look no further than this 1990 Jefferson 48, priced right at $138,900 (offers encouraged). This vessel is located in Ponce Inlet, Florida. She is also equipped with twin Caterpillar engines. 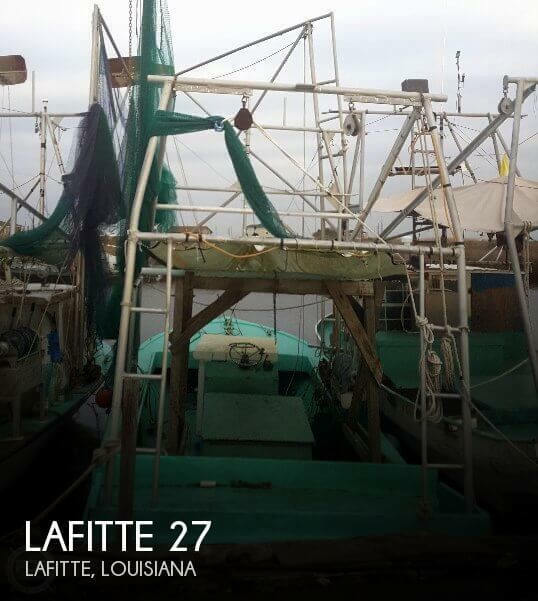 Boat is in very good condition and has been ugraded. Repowered with twin Mercury Verado four stroke engines. Upholstery is like new, boat is clean. Electronics are operable. Trailer has no signs of rust and tires have good tread. Stock #173295 Dual helms! 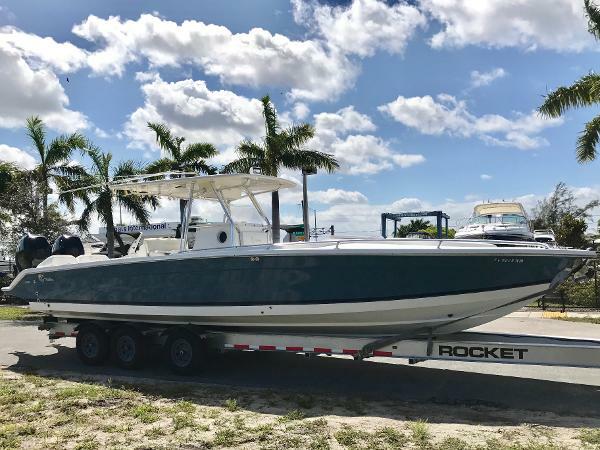 New everything and only 41 hours on the engines If you are in the market for a center console, look no further than this 2001 Jefferson 35, just reduced to $109,900 (offers encouraged). This vessel is located in Savannah, Georgia and is in great condition. She is also equipped with twin Mercury engines that have only 41 hours. Reason for selling is down sizing. As you can see from the pictures this 1997 Jefferson 40 Cockpit MY could use a good cleaning. Seller states the boat is in good running order. The aft master suite toilet does not work nor does the main refrigerator in the galley. One panel of the eisenglass is damaged beyond repair. Dinghy in pictures is not included. Stock #168402 Low Hours! Updated Electronics! Perfect For The Great Loop or Live Aboard! Priced To Sell Quick! Bring Your Offer! 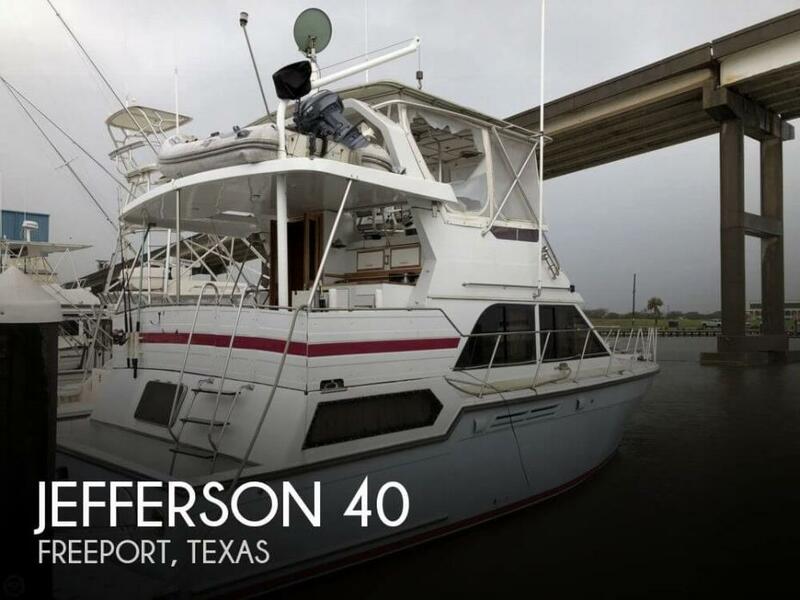 If you are in the market for a motoryacht, look no further than this 1997 Jefferson 40 Cockpit MY, priced right at $112,500 (offers encouraged). This vessel is located in Freeport, Texas and is in decent condition. She is also equipped with twin Cummins engines that have 3,460 hours. Reason for selling is wanting something different. 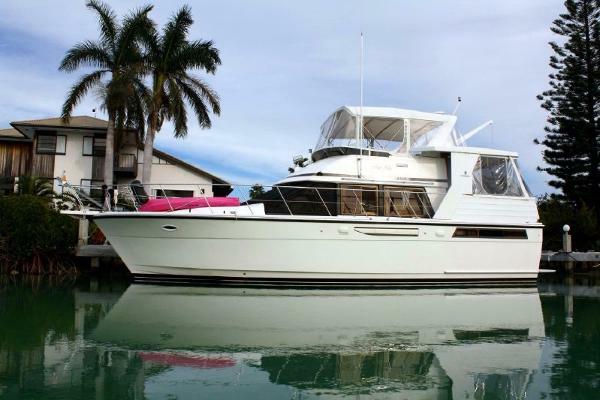 Stock #165168 Beautiful and well maintained 1989 Jefferson Marquesa motor yacht! 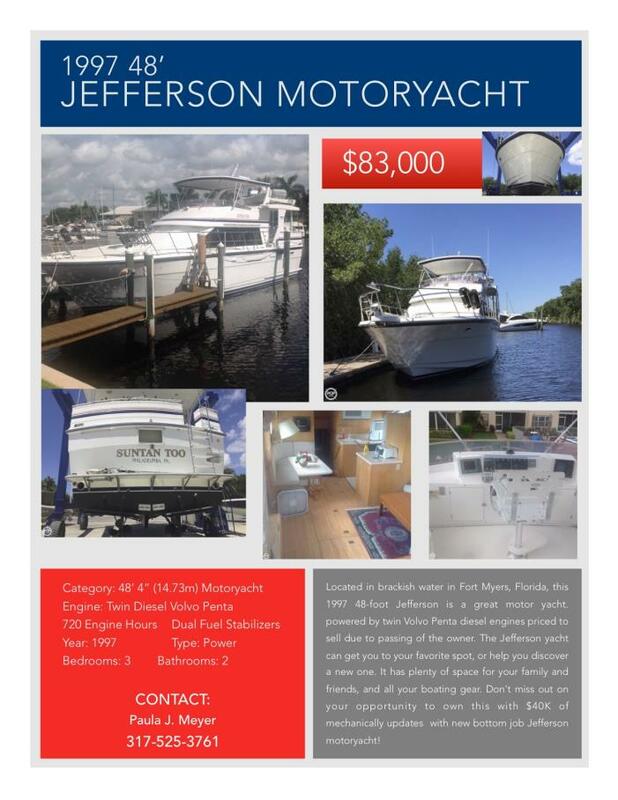 If you are in the market for a motoryacht, look no further than this 1989 Jefferson 52, priced right at $254,500 (offers encouraged). This vessel is located in Dania Beach, Florida. 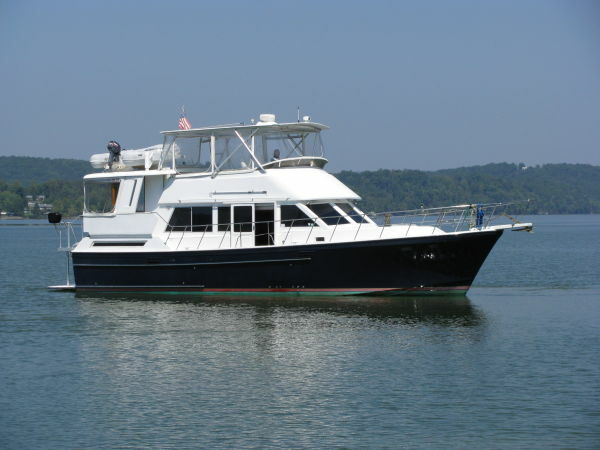 She is also equipped with twin Detroit Diesel engines that have 2,200 hours. 1994 Jefferson Rivanna Cockpit MY The Sea Dream is a spacious 52' Jefferson Rivanna with a full cockpit for comfortable sport fishing and a full width swim platform for easy snorkeling and dive boarding. 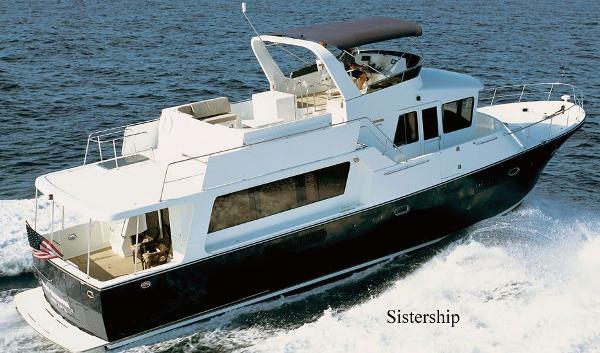 It offers a great deal of livability with 3 staterooms and 2 heads making it perfect for cruising or liveaboard. The master stateroom has a queen berth, an ensuite head and shower and a glass door to the aft deck. The 2 guest staterooms are forward, one with a queen berth and private entrance to guest head and the other has a double berth that could also be used as an office. Sea Dream has received a number of significant recent improvements and general preventative maintenance work. 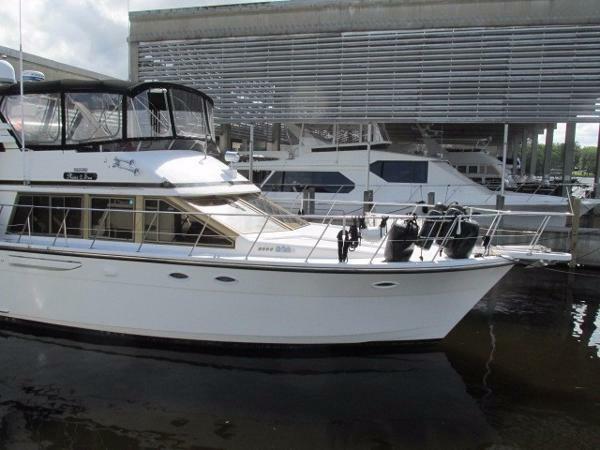 The yacht is in excellent condition, well equipped, recently updated and ready for cruising. New engine batteries January 2017 and new generator battery January 2017. The Cummins Diesels and the Westerbeke have low hours and are in excellent condition. The current owner has put very little hours on the engines. Sea Dream is attractively priced in today's competitive market to reflect the owners desire to sell quickly. An excellent opportunity to acquire a comfortable cruising yacht well appointed and updated. 1993 Jefferson 46 Marlago This yacht has been beautifully kept as a part time Southern California live aboard. She has been meticulously updated with modern fabrics, wood blinds, custom valances and the list goes on and on! Custom storage features have been added and upholstered items have been refreshed, added, or replaced to give this yacht a contemporary look and feel. This yacht sleeps seven adults comfortably in three staterooms and a pull out in the main salon. Her two head, two shower and one tub arrangement means that you can invite the whole gang for summer fun! 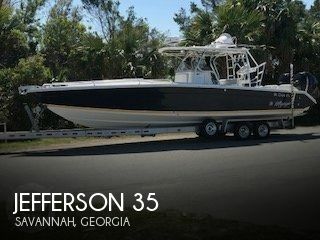 2007 Jefferson Marlago 35 Cuddy Lift-kept, 1-Owner 2007 Jefferson Marlago FS 35 with Twin 250 Verados (just serviced March 17) in Excellent Condition. Less than 700 hours. No bottom paint. Solid fiberglass T-Top w/ TACO outriggers and rod holders. Updated SIMRAD electronics package in 2017 (GO9, Transducer, Autopilot) NMEA 2000 integrated engine controls, VHF, Fusion Stereo, Amplifier, Subwoofer. Mercury digital smart craft engine management system. Removable aft bench seat. Searchlight, Windlass, SS polished anchor, Battery charger, Bait prep station, live wells, fresh and raw water wash down. Fish boxes. JUST SERVICED UPDATED ELECTRONICS AUTO PILOT NMEA 2000 (MAR 16) This boat is built for comfort, speed, agility and fishing combining the best of all worlds. With a cruise speed of 40 mph and top speed of 55 mph, this boat can get you to your favorite fishing spot quickly. Built in trim tabs make a smooth ride. Finished in Air Force Blue with Navy Stripe hull sides. Cushions were recovered 2 years ago and the boat comes with a color-matched Aqualon complete mooring cover that protects the complete deck area. 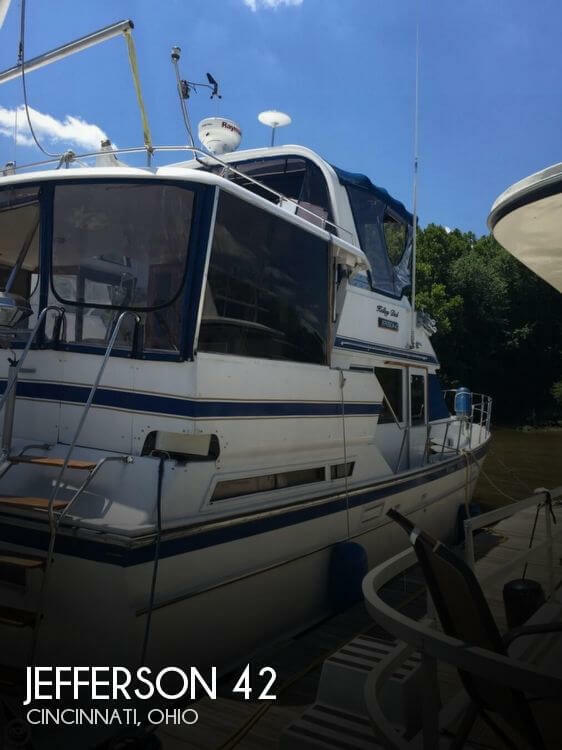 Spacious lighted cuddy cabin with a 9-foot-long V-berth and 47 headroom, sleeps 2, full, in-console marine electric head with vanity and shower. 3x built-in coolers. Well-maintained. Priced to Sell. All the Extras. 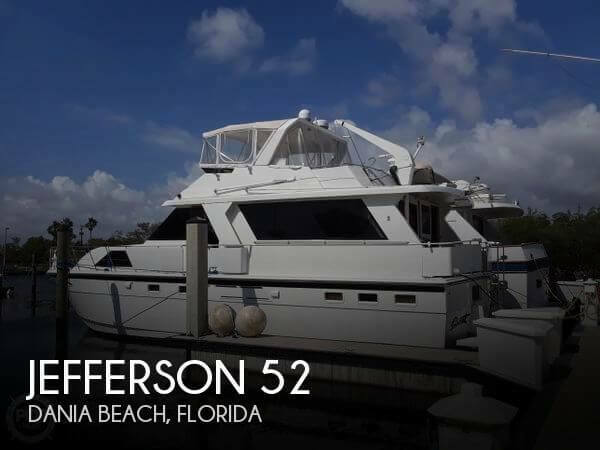 2003 Jefferson Pilothouse VIRTUAL TOUR: https://yachtprofile.com/ypj57m Brand new to the market, please take a moment to review our specifications, photographs, and virtual tour. 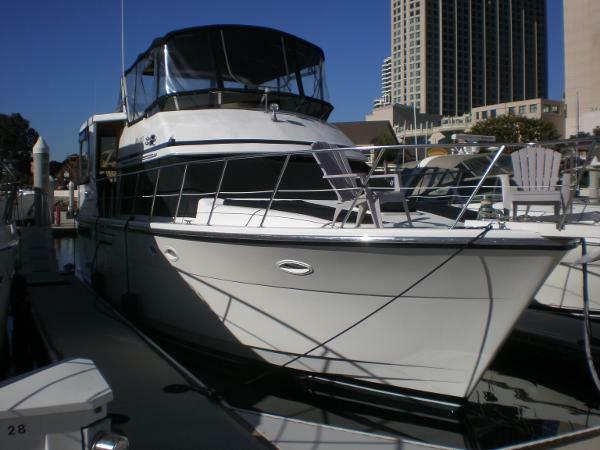 Lady Margaret is a clean version of Jefferson Yacht's 57' Pilothouse Motoryacht. The current owner purchased this yacht in 2015 and since that time, he and his family have experienced what many of us dream about. 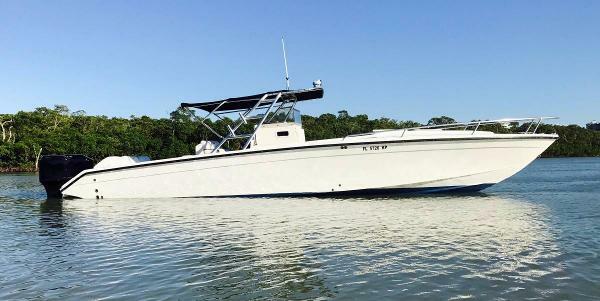 After island hoping with his wife and children all throughout the Bahamas and Florida Keys, Lady Margaret has sailed back to her home slip in Delray Beach, Florida. Lady Margaret is powered by twin 825 HP Series 60 Diesels meaning this Jefferson will cruise fast if necessary. The interior of this yacht offers all the comforts of home and notice the wood joinery is still looking spectacular! Lady Margaret is available for client inspections or broker previews anytime by appointment. 1992 Jefferson Marlago Sundeck Jefferson Yacht 1992 43 Marlago Sun Deck LOW Hours! Attention All Loopers we have here one of the best vessels you will find to complete Americas Great Loop. "For Loopers, Downtown Chicago bridge clearances must be considered. Mint Julep's vertical clearance is 19', with antennas down, but is 16'5" with its radar array removed (four bolts), allowing for easy clearance through Chicago." This vessel has been upgraded with many very important items noted in the equipment list for the new owners to make your cruising experience easy and enjoyable. Please note that many were added during their vast cruising experiences as dictated for safety and comfort.